If you would like to adopt one of our bears, please contact us by email at jubearybears@hotmail.co.uk or on +44 (0)7711 191241 and we shall advise you of availability. 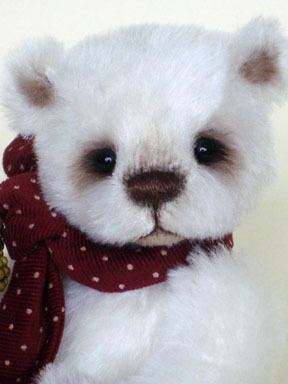 For specially commissioned bears, we reserve the right to consider the order as cancelled if payment or contact is not made within 7 days of the date of completion of the bear. We also reserve the right to substitute a mohair or other fabric for one of equivalent quality and of a similar colour or style if the original is unavailable. We will discuss this with you at the time of you placing your order. If you order a one of a kind bear or furry friend made to your special requirements, please state the exact description of the bear/furry friend in writing, this helps to avoid any confusion and becomes legally binding. Please note that we are not taking any special commissions during 2018. All prices are exclusive of postage and packing. UK Deliveries - All bears will be sent by Royal Mail Special Delivery. Overseas Deliveries - All bears will be sent by Royal Mail International Tracked Service. Please note that shipping is charged at cost and is based upon volumetric weight. If you wish to order two or more bears and these are purchased at the same time and delivered together, we are more than happy to offer a discount on the postage. Our preferred method of payment is PayPal. However, we also accept payments by:- credit cards, bank transfer or cheques (UK Pounds Sterling only - made payable to Ju-Beary Bears). All bears are the property of Ju-Beary Bears until clearance of funds. Please allow five to seven working days for PayPal clearance and seven working days for cheque clearance. Once payment has cleared, we shall despatch your bear and contact you by email to let you know your bear is on its way and provide you with the tracking details. All our bears and furry friends are carefully checked and packaged prior to despatch, however, if you are unhappy with the bear you have ordered, please contact us immediately and we will endeavour to put this right for you. If you are still dissatisfied, please return your bear to us within fourteen days of receipt and we will issue a full refund less postage provided the bear is returned as new. Please note that refunds will only be given upon receipt of the bear. We are pleased to offer a layaway service and will happily reserve your chosen bear with a deposit (non-refundable) of the purchase price. The deposit will be one third of the purchase price including postage and packing at cost. Thereafter two equal monthly instalments will be payable. If you would like to purchase a bear using this service, please contact us for further arrangements. You can find a summary of the Trading Standards Laws at: www.tradingstandards.gov.uk. Please do not copy / reproduce any of the website content without express written permission. Whilst every effort has been made to ensure that the bears on our website are accurately represented, there may be slight variations in colours and textures of fabrics due to different settings of monitor displays and lighting at the time of photography.